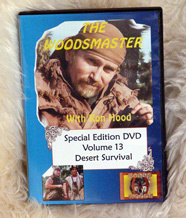 In this volume of the Woodsmaster we traveled to deserts ranging from the California Mojave Desert to the Bruneau Desert of Idaho to the beautiful desert mesas of Utah?s Moab. During the course of our travels we were able to capture the essential skills of on-the-ground desert survival. During the 1 hour and 40 minutes of this great video you will learn the essentials of water location, desert travel, desert shelter, Physiological effects, clothing and protection. 1 hour and 40 minutes of hot instruction... It was really hot!